Sophie Goldstein is a cartoonist and illustrator based in Pittsburgh, PA. Sophie’s most recent graphic novel The Oven was published by AdHouse Books, and was met with critical acclaim. You can see my review of The Oven here. 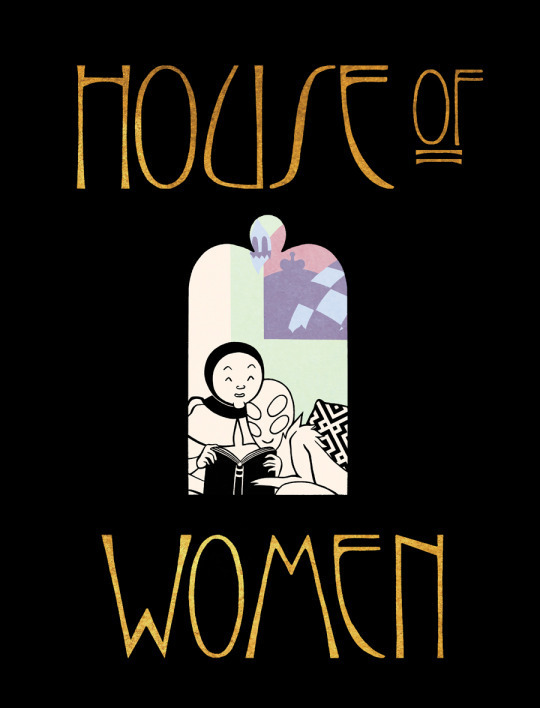 House of Women is Goldstein’s ongoing comics project, and the second volume debuted at SPX in 2015. The story features a group of women serving as a kind of educational mission expeditionary force for a galactic Empire that wishes to educate the natives of a jungle planet. But struggles internal to the group and the strain of the unknowns of a foreign planet make the education mission much more uncertain and dangerous than previously thought. The first volume in the series won the 2014 Ignatz award for “Outstanding Mini Comic.” Sophie was nice enough to talk with me about the series and her goals for the third volume. Alex Hoffman: Thanks for taking the time to talk with me Sophie. Sophie Goldstein: It’s my pleasure. AH: In my mind, much of your work straddles the line between science fiction and horror. I’m thinking about some of your short stories, but House of Women specifically has this psychological tension associated with the unknown. I was wondering if you could talk about that. SG: I’ve always had an interest in science fiction, first as a reader and then later as a writer. I think what I like about it most is that it allows me to explore the psychology of characters in situations geared towards extremes—like the desert wastelands of The Oven or the exoticized fecund wilderness and natives of House of Women. I don’t have to worry about the “plausibility” of any story beyond the internal logic of the story and the characters. The only time I’ve set out to make a straight-up horror comic was for Spike Trotman’s Sleep of Reason anthology. My other comics with horror elements, “Food Chain” for Trip 8 and “The Good Wife” from Best American Comics 2013, are body horror in SF and Fantasy clothing. I don’t really know why body horror comes up in my work—when I watch horror movies I prefer supernatural horror to anything overly bloody or violent—but it’s certainly fun to draw. I think it’s a lot easier to take abstracted in a comic then literally depicted on a screen. I remember watching an episode of Æon Flux when I was a pre-teen that basically scarred me for life. With regards to House of Women I will say that if you think it has a horror vibe now… just wait for Part III. AH: That’s exciting – I don’t really like horror movies, but I’m a big fan of horror comics and horror fiction. I think that there are great things about horror as a genre but I really hate a jump scare. SG: A lot of horror enthusiasts think jump scares are cheap but I love being scared and however the filmmaker gets there is alright by me. Horror comics operate in a different way though. Page turns can be effective tools for surprise, but you can’t control how long someone has to take in an image like you can in film. I think the best horror comics explore the psychological and existential dimensions of the genre. AH: I agree. I think that my being able to control the page turn and see the image is a huge reason why I like horror comics. I want to be scared, but on my terms. It’s sort of a contradiction. SG: When I was a kid I really loved those “Scary Stories to Tell in the Dark” books, but I sometimes found the illustrations so frightening that I would cover them up with a sheet of paper while I was reading the text and only remove the paper to glance at them. So, I get where you’re coming from. AH: In a lot of ways I feel like The Oven, your new book with AdHouse, is science fiction set in the “now.” There are all these contemporary references that resonated for me, especially with the ongoing heroin crisis in the heartland. It feels like House of Women has a lot of imagery that reminds me of 70s science fiction. Do you think anything in particular inspired this story or its setting? SG: House of Women is largely inspired by Powell and Pressburger’s 1947 film masterpiece Black Narcissus, about a group of nuns who start a school in the Himalayan mountains. I took the basic framework of the story and recast it in a science fiction setting and I think it’s those science fiction elements which drove the plot in a somewhat different direction from the movie. 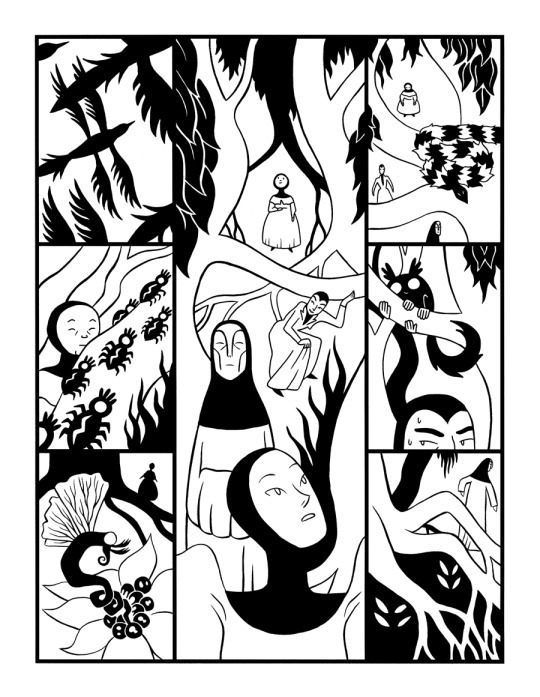 The visual look of the comic is based on Art Nouveau artists like Aubrey Beardsley, Klimt, Mucha and the Japanese woodcuts that inspired them. I also treated P. Craig Russell’s “The Magic Flute” as a kind of art-nouveau-comics-bible. I don’t think there are any 70’s references I drew from but if you can think of any specific titles I will definitely add them to my reading list. AH: I wouldn’t say it’s a specific film or book, but it feels like some of the emotional texture jives with some of the science fiction I’ve seen from that time period. The hopeful exploration and colonization from earlier science fiction gets recast in a more cynical light, and there’s a xenophobia to that fiction that feels similar, although I don’t necessarily know that I would call any of your characters xenophobic. SG: I would! All the characters have a patronizing/paternalistic attitude towards the natives—even Kizzy, who loves them, and Jael, who lives very closely with the natives. I guess in many ways they’re just like the British colonialists of Black Narcissus—TNG this ain’t. AH: That’s a great point – and I think Star Trek is a great example of earlier science fiction, with its grandiosity and its hopefulness. SG: Well, Star Trek is very much of the era in which it was originally conceived—the 1960’s. Science fiction before that tended to be more jingoistic and since then has more often dwelt on the possible costs of technological advances then its benefits. However, I think one possible explanation for this negative bias may be that stories need conflict, rather than that writers have become more cynical—Roddenberry’s utopian vision for Star Trek often caused a lot of consternation in the writer’s room. AH: One of the similarities of your two latest major projects is the rigidity of the major background powers in your stories – I’m thinking about the governance of the bubble cities in The Oven and The Empire in House of Women. Could you speak to that? SG: It’s not something I set out to do, but I would say it most likely stems from my coupled distrust of large organizations, with their opaque anti-human agendas, and a more utilitarian need for a story catalyst. AH: I wanted to take some time to ask you about the construction of House of Women as a physical object. These books have die-cut covers, rounded edges, gold ink overlay, a color page insert – they’re gorgeous physical objects. But my guess is that they’re a lot of work? SG: Oh my yes. I’ve had a lot of practice (Part I is up to 400 copies) but they’re still laborious. The covers are black ink on gold paper—not gold ink on black, so that’s a lot easier to manage. Everything can be printed at my local copy shop if I’ve ordered the paper ahead of time. Probably the most time-consuming part are the die-cuts, which are done by hand with an x-acto knife. The rounded edges are done with a vintage corner-rounder I bought off ebay and will probably never use again after the full run is done. It is worth it though—people really respond to thoughtfully produced mini-comics. I think there’s will always be a market for physical books, even as the digital experience improves; it’s just up to the artists to make that book an aesthetic experience as well as a good story. AH: I think that when you start expanding the way you think about book design, a book can become a much more multisensory experience. The die cuts especially invite the reader to “feel” your comic as well as read it. SG: I want the reader to feel as if they’re being drawn into the book through the die-cut windows. Or, at the very least, to make them interested enough to open the book and see what’s inside. I guess the feeling I most want to evoke is curiosity. AH: One of the keys to the conflict in issue two of House of Women is the idea of the native transition from a larval agender to either a male or female gender. From what we understand, the male of the species is dangerous to the women of the expedition. But the information about the males of the species comes from a somewhat disreputable source, also male. What I’m sort of getting at, in a roundabout way, is that the male gender in this comic is associated with all of the tension and violence of the series. I’m seeing corollaries in our world, and I’m wondering if you could talk about that theme. SG: I’m not sure I entirely agree with that interpretation. Jael may be, as you say, disreputable, but I’d hardly call him violent. Rhivka is a far more destructive figure. Nor do I think the extreme gender disparity of the Mopu natives represents my own views on men and women. I guess, if I had to be in the uphappy position of interpreting my own work, I’d say they represent the concepts of femininity and masculinity. I’m sure there are larger sociological implications, like you alluded to, but as a writer I generally find it more fruitful to focus on the psychology of my characters and the engines of my plots and leave the larger thematic thinking to the critics and readers. AH: That’s a hard way for me to think about comics, but I think it makes a lot of sense as the writer. What I meant with Jael isn’t necessarily the violence piece, but I think his presence is a major source of tension between the women in the cast. 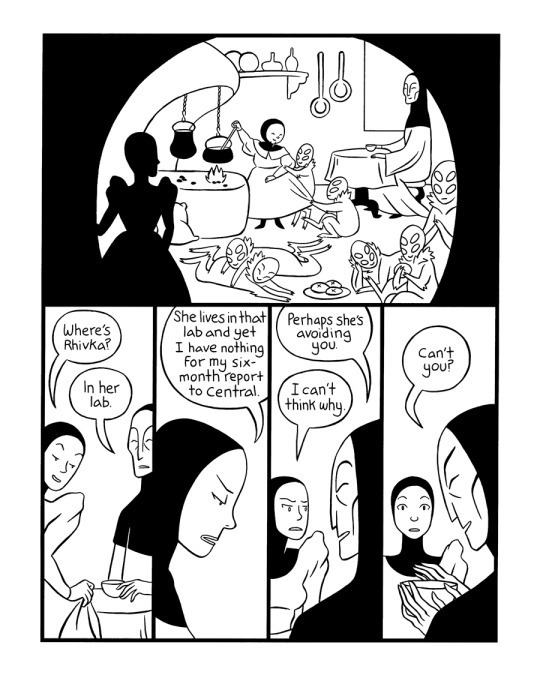 AH: One thing I’ve noticed in all of your comics, and House of Women especially, is an economy of narrative. You tend to let readers discover the world as you move along, and you let small ticks, facial expressions, or conversations do the worldbuilding. Would you agree with that observation? SG: I think I would call that my best case scenario. There’s a tendency in science fiction to over-explain or get distracted by the minutiae of world-building, but I try to avoid anything that’s purely expository. Acting is very important to me and probably the drawing task I spend the most time on. I love static sequences where you can see the changes in a character’s expression and gesture. Rhivka is by far the broadest character to draw in terms of expressive range and that’s probably why she’s my favorite. Sarai is the hardest to draw because her expressions are so subtle—which is unfortunate because she’s in pretty much every scene. With House of Women I do slow down somewhat and I include a lot of atmospheric shots—people moving through the palace and the surrounding jungle—but probably what seems slow and lush to me might still seem lean to a reader. I think I’m fighting my natural tendency towards austerity. AH: Austerity is a fascinating word to use in regards to a creative process. Could you explain that a bit more? SG: I’ve never had a lot of “business” in my stories; fun bits that don’t have any specific purpose beyond enhancing the reader’s enjoyment (or indulging the writer). Usually if I have a scene in there it has a specific function in the story; either moving the plot forward, revealing character, or ideally both. The same goes for the visuals. I don’t think that’s necessarily a better way to write but it’s my style and I don’t think I can really escape it. AH: The ending of House of Women Part II leaves us on tenuous ground, especially with the pending transformation of Zaza and the rift between two of the members of the Empire’s expedition. What are your goals for the rest of the series? Is Part III the final act? SG: Yes! Part III will be the final—hopefully thrilling—conclusion to the series. Having started this book back in 2013 I would have to say my biggest goal is just to git ‘er done, so to speak. It’s hard to have a project drawn out over an extended period of time, interwoven with other deadlines and projects, and still be fired up about it. I think I’ve been fortunate in retaining my excitement for House of Women, possibly because it’s just so different than anything else I’ve done and the art is much more interesting to create. Also, I hope people like it? That’s a definite goal. I’ve had some very devoted readers for Parts I and II and I’d hate to leave them disappointed. Thanks again Sophie for speaking with me. You can see more of Sophie Goldstein’s work and find out more about House of Women here.